We want to show you how easy it is to mix all of the Paper Sweeties Stamps and Sweet Cuts to make all kinds of cards and projects! I chose to create another shaker card with the new Stitched Tags #1 stamps and matching Sweet Cuts with the older Hello Friends and Banner Wishes stamps. My card really showcases the new Stitched Tags #1 stamps and matching Sweet Cuts. I just LOVE these because they are so versatile. And the stitched detail is so cute! And don't cha just love the bows??? I thought this design paper was the perfect background for those bows! Please go visit my Paper Sweetie Teamies! I hope you have enjoyed seeing all our creations! This is gorgeous! 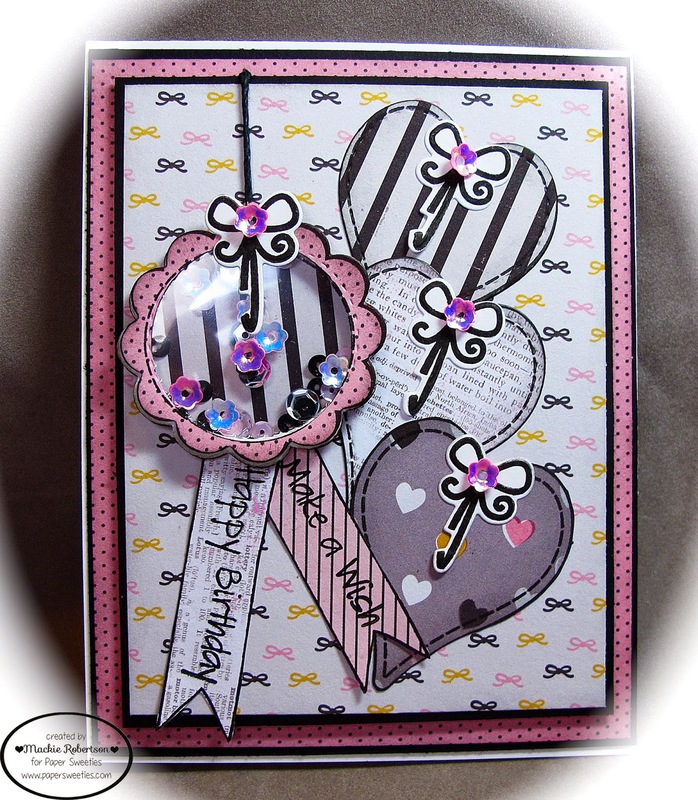 Love the cascading hearts and your shaker is fabulous with the polka dot paper and striped background. Mackie this is GORGEOUS! And yes I love the bow! I feel like I have barely begun with these sets! So many ideas I still want to try! Love your designs so much!!!! Gorgeous, Mackie! Love those stacked hearts. And a shaker too, wonderful! Great colors! Ohhhhhhhhhhh this is gorgeous!! LOVING the colors and the hearts!!!!!! So pretty Mackie! What a fun shaker! Love the trio of hearts! What a super cute gorgeous card! I have never made a shaker card before - this has inspired me to do so! What a cute shaker, this is sweet Mackie!! Mackie, what a wonderful design! Love how you used the bow on the Valentines! Hope you have a wonderful week!